Why should I use BRYSCAN moisture sensors ? Moisture content is one of the most important variables and challenges, the high quality producer must face. Excessive moisture is usually undesirable in many products; both organic and synthetic such as foodstuff, plastic, paper, wood, drugs, cement etc. Likewise, many products can experience strength and integrity degradation when too much moisture is present. Moisture content can generate many kinds of undesirable effects, including processing problems, poor surface on molded parts, or loss of mechanical properties adding extra drying costs. Keeping moisture under control during the whole production cycle allow considerable savings to the companies. What methods are commonly used for testing moisture ? The moisture content can be measured by means of many commercially available devices : loss-on-drying (LOD) or loss-in-weight, ‘manometric method’ and ‘Karl-Fischer tritation’ systems are widely in use in the industry and in particular in the plastics industry . To eliminate any possibility of error, the specimens are to be taken in sufficient depth onto a hopper, and must be stored in an appropriate sealed container, usually sealable bags or laboratory hermetic containers. These devices system usually requires specific knowledge of laboratory and in addition, the result is often particularly affected by the method of sampling, environments and human errors. What are the main differences between a laboratory and online measurement ? Under the common name moisture analyzer, thousands of systems can be found on the market, the applications and purposes for which are designed are different. All the in-line devices are so called “indirect methods”. Indirect methods use the change in an electrical or structural characteristic of a material as a relationship of its moisture content. Common measurements are changes in capacitance, conductivity, reaction to radio frequencies or microwaves, in addition changes absorption of electro-magnetic radiation relate to changes in material moisture. Because these methods are indirect, a calibration against a known moisture amount is needed. This extra, offers the speed of obtaining a moisture measurement (seconds instead of minutes), and allows a quick fix of the production process. Lab devices have a higher accuracy but the sample (normally 3-20gr) is not representative of ongoing production. (Thousands Kg) Additionally lab instrument requires special expertise by technologist rarely found in most production companies. By contrast, In-line device does not require any specific knowledge of physics/chemistry of materials to control. How does BRYSCAN system operate? Moisture measurement technique is based upon the relatively high dielectric constant of water in comparison to the dielectric properties of other materials also includes the measurement of diamagnetic properties. The variation of water content within the product, would result in a large variation in the combined dielectric constant which would then be measured by monitoring the change in the dielectric signal. Both the phase shift and attenuation would be affected by the change in the dielectric constant of the analysed material. Additionally measurement is effected by the excitation of free moisture molecules when introducing a controlled magnetic field which is also measured with a 32 bit dedicated microprocessor. Moisture measurement data are collected and processed within 30mS. BRYSCAN uses indirect method and a calibration against a known moisture amount is required. The physic values are allocated to the values using a primary reference methods (e.g. Karl Fisher). The determination of core moisture content indipendently to the density, colour and surface structure in organic or synthetic products. like all systems of indirect measurement BRYSCAN is also subject to errors due to the density, the lack of homogeneity of the blend, additives, temperature and so on. To improve the accuracy and repeatability, BRYSCAN systems are supplied with calibration curves for each material (recipes). These corrections allow to detect the moisture measurement properly. Because field conditions can change rapidly, accuracy guidelines must be considered in terms of “ranges”, not absolute number. Claims of accuracy should be taken with caution, because it is unlikely that such claims can be consistent: the results are often affected by the method of sampling, environments, speciments size and human errors; Several Standard procedures define for accuracy tests any “difference between two test results for the same material, obtained by the same operator using the same equipment on the same day in the same laboratory”. Although we have established some calibration procedures following ISO and ASTM standards, there is no certain reference to control measures and inter-laboratory data. However our systems, are provided with a function that allows you to align the measured values with the values derived from offline devices, by simply pressing a button. Is there a way to make sure my sensor is calibrated ? Yes ! Zeroing of the sensor is required on each change of product and it can be perfomed manual or automatic. Auto-calibration function developed by Bry-Air PROKON, showed significant increase in performance of the sensor presenting a considerable enhancement of the measurement accuracy and repeatability. References physical sensors inputs are used to allow the adjustment of the measurement and to calculate the calibration coefficients, so the transfer function of the measurement chain is corrected in real time. How does BRYSCAN affect my production ? Each user believes its instrument the absolute reference and this is probably true as the given results decides when the product is ready for further or final processing. The use of BRYSCAN sensors requires a different and innovative approach to your production problems, the question is not which is the absolute value of the moisture content, but the very question is: my product is ready for processing ? If a problem occurs, can I act immediately or automatically ? Your product is constantly monitored, giving you several informations about performance of the dryer or a previous operation. Which maintenance should be carried on BRYSCAN ? Proper operation over time is achieved when the BRY-SCAN measuring sensors has no debris, dust, dirt or any other contaminate substance that might prevent proper operation. While the BRY-SCAN measuring sensor does not require special maintenance, some precautions are necessary to keep the system proper operation. The passage through the sensor of some products may generate dust or other contaminates that with time tends to aggregate and stick to walls of the sensor. These residues can distort the measurement, it is necessary to remove all traces of the product using a dry cloth or compressed air. How and where to install BRYSCAN ? The sensor should be installed at the best sampling position in your production line, To avoid source of errors the sensor should be always fully filled with material. Proper functioning of the sensor is achieved when installed in a vertical position, although it is possible to install and position the sensors in every position as long as it is completely full of material at all times. I have a new product, do I need a new recipe or a re-calibration ? Providing the material to be measured is in the range of measurement of the sensor model there is not need of any re-calibration. If the product, is not similar in chemical composition or dimensions, a new recipe is required. You can find the most common products in our customer support section, if the product is not available, please contact Bry-Air PROKON here. Is there a way to record data ? Each BRYSCAN system can be supplied with an ethernet interface (Modbus TCP / IP) or FTP server. You can use your SCADA system or data acquisition or purchase one of our tools for the PC running with most spreadsheet systems such EXCEL. How many sensors can I connect to my Control Box ? Each BRYSCAN system can control up to 8 sensors, with no extra hardware or technical assistance. The system can be implemented at any time by purchasing licenses. For any further questions on bryscan system license, please call us at +41 91 683.09.71 or fill out Request Form here. I need to interface BRYSCAN with my machine, which interfaces are available ? All systems BRYSCAN can be supplied with I / O or Analog. they are available with all the interfaces commonly used in the industry. For any further questions on bryscan system license, please call us at +41 91 683.09.71 or fill out Request Form here. Is BRYSCAN contaminating my product ? Are loss-on-drying (LOD) systems suitable for measuring moisture in polymers ? Because many potentially volatile compounds are contained in plastic resin, It is unlikely that quantify water content of the material by simply heating a sample, measuring the resulting weight loss, leads to the conclusion that the entire weight loss is water ! 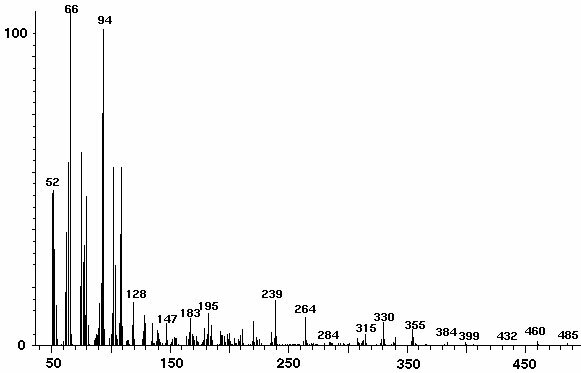 Figure 1 shows the results of a PY-MS test performed on a nylon material.Each peak in the graph represents a compound that was evolved from the material. One of these will be moisture (water) and the rest are something else. Because water is one of the lower-molecular-weight compounds that will be contained in a polymer, it will be one of the first to evolve; therefore, it is likely to be one of the peaks captured in the first 1-2 minutes of the scan. The peak heights represent relative abundance and it is fairly easy to see that when the test time approaches 30 minutes, most of the volatile material has been captured. It is equally easy to see that the single peak that represents water accounts for only a small percentage of the total material that is collected. particular excitation frequency, measurement is effected by two dielectric absorption peaks for free and bound water molecules when introducing a controlled field. The material being read by the sensor is represented by a MIX of permittivities, mainly from 3 different variables : AIR, WATER and MATERIAL. Each element contributes to the variation of total capacitance of the sensor. Knowing each single contribution of the total dielectric constant allow BRYSCAN sensors to measure the quantity of water. 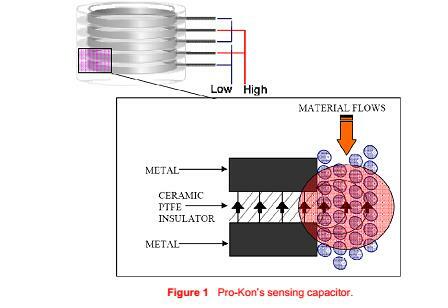 The patented moisture sensor developed by PROKON mainly comprises two components: the fullydifferential sensing capacitor and the high-precision high-resolution readout electronics. The fully-differential sensing capacitor detects the changes of moisture based on the edge/fringe effect as shown in Figure 1.